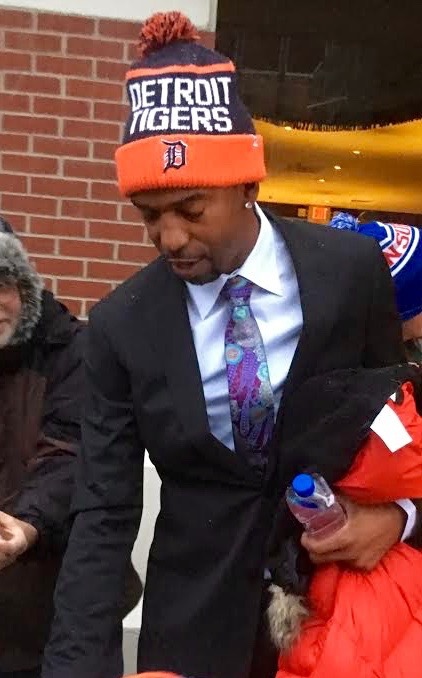 Recently, iFolloSports.com Michigan based correspondent Lance Martinez captured this original photo of Richard Hamilton signing autographs outside a Detroit area hotel. The scene took place a few hours before the Pistons retired Chauncey Billups number. Hamilton is a former shooting guard/small forward who played in the NBA from 1999-2013. The Pennsylvania native took the court for three teams, most notably the Pistons, where he was an integral part of Detroit’s 2004 championship team, who upset the heavily favored Lakers in the finals. For his career, Hamilton averaged 17.1 points, 3.4 assists and 3.1 rebounds per game. He was elected to three All-Star teams. Looking back to his college days, Hamilton was named the 1999 NCAA Final Four Most Outstanding Player, when he led the UConn Huskies to victory over Duke in the 1999 NCAA Championship Game.